Major League Baseball is back and Lou has returned to the on field photo pits for his 12th straight season. For Opening Day he was in our nation’s capital getting images of his beloved New York Mets versus the hometown Washington Nationals. The Mets took the game 2-0. Look for Lou at various stadiums around the league this season. He’s hoping to make some locations he’s never shot before including Atlanta, Cleveland, Boston and St. Louis. 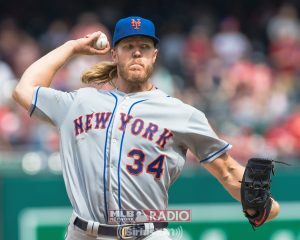 The images are used by MLB Network Radio. Happy Birthday messages have been pouring in from around the world for Darla the Wonder Dog! Later in the evening, Darla took control of Lou’s Twitter feed answering questions from fans before retiring for the evening with more snacks and rubs. Thanks again to everyone for reaching out to Darla and following the hashtag #aDecadeOfDarla. One of the most legendary music festivals on the planet returns! It’s Rock Fest in Cadott, Wisconsin and Lou Brutus is back as host! The sick lineup runs July 18th thru July 20th. It includes Rob Zombie, Marilyn Manson, Five Finger Death Punch, Breaking Benjamin, Evanescence, Mastodon, In This Moment, I Prevail. P.O.D., Lacuna Coil, Red Sun Rising, Three Days Grace, Killswitch Engage, Asking Alexandria, From Ashes to New, Shallow Side, Rachel Lorin, Skillet, Starset, Of Mice & Men, Static-X, Dope, and too many more to mention! Along with his stage duties, LB will be backstage interviewing the artists and in the photo pit capturing images. Be sure to find him for limited edition Brutus Rock Fest items! Tickets are on sale now and available here. See you there! Brutus loves taking part in musically themed hashtags on Twitter and so was stoked to be invited by @HashtagRoundup to guest host his own game. 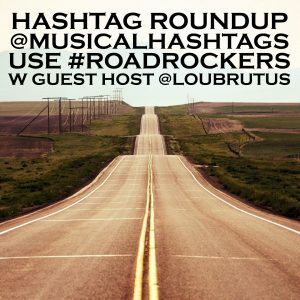 It was Tuesday January 22nd that LB joined up with @MusicalHashtags for #RoadRockers. Basically, it was word play puns mixing automotive terminology with your favorite bands and musicians. Not to be outdone by anyone in the bad pun department, LB led the way when the game began with entries like Avenged Manifold, MiniVan Halen, Linkin Parking Garage, Metallicar, and Pontiac! at the Disco. It got even punnier from there. The hashtag quickly went to the Top 10 on Twitter worldwide. Many thanks to @RobinDWoskin for the invitation to guest host. Hope you’ll have Lou back again soon! On January 16, 2019 the music world came together to celebrate the life and music of an artist of great talent and integrity. 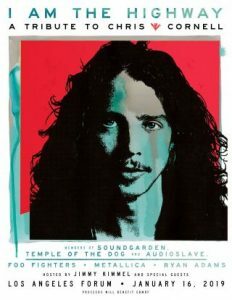 “I Am the Highway: A Tribute to Chris Cornell” was held at the Forum in Los Angeles. The show featured performances by members of Soundgarden, Temple of the Dog, and Audioslave. There will also appearances from a Who’s Who of the Rock world including Metallica, Foo Fighters, Taylor Momesen, Peter Frampton, Ryan Adams, Josh Homme, Fiona Apple, Brandi Carlile, The Melvins, Miley Cyrus, Rita Wilson, and members of Pearl Jam among many others. While in Los Angeles recording with KISS, LB attended the show and you’ll hear interviews with many of the artists regarding it on upcoming editions of hardDrive XL with Lou Brutus. 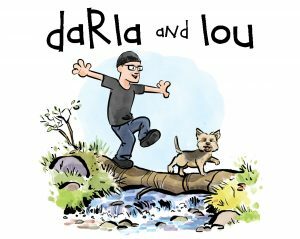 The 2018 holiday card from Lou and Darla has been revealed and it may be the best yet! 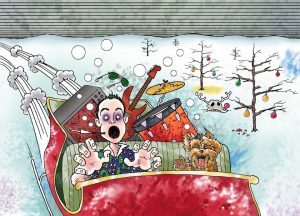 Based on Ralph Steadman’s “Bats Over Barstow” illustration from Hunter S. Thompson’s landmark novel “Fear and Loathing in Las Vegas,” Lou’s is “Fear and Loathing at the North Pole.” It features he and Darla maniacally sledding through a frozen landscape. The art was created by LB’s longtime partner in artistic crime Alan MacBain of the Alan MacBain Cartoon Company. The art can be enjoyed online. A select few physical cards went out to family and friends. Also, as the best way to get Christmas card from someone is to send them card, Lou mailed off cards to a number of listeners who had been kind enough to send to him. After nearly a year of working out the logistics, Tobias Forge of Ghost and Lou Brutus sat down for an hour long interview in New York City in early-December. Tobias and Brutus made special trips to NYC to make this happen. The conversation was both filmed and recorded at the hardDrive Radio Studios in Manhattan. You can see much of it via YouTube here, here, and here. You can also read about it here on Blabbermouth. Both gentlemen returned to the area a couple weeks later for the closing night of “A Pale Tour Called Death” at the Barclays Center in Brooklyn, NY. 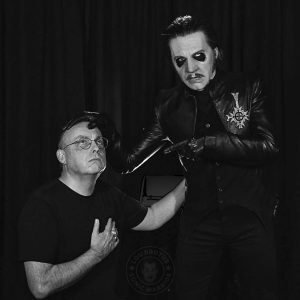 After receiving a blessing from Cardinal Copia backstage, Lou hit the photo pit to capture images of the show that you can see on his social media accounts. 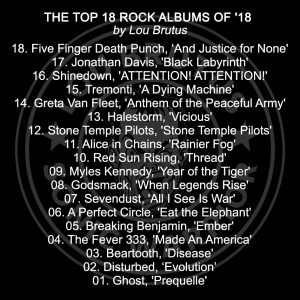 It’s that time of year when LB puts together a list of The Top 18 Rock Albums of ’18 that immediately causes everyone to fuss and fight. “I both love and hate doing these lists,” says Lou. “I love looking at all the great music that came out. I hate that as soon as I publish it, I want to change it. Frankly, it’s also crazy that I’ve limited it this year to just eighteen albums. It really means I’ve cut out some albums that I admire and respect. However, it’s more of a challenge instead of putting out multiple lists of rock and metal albums with up to fifty albums each.” He continues, “The #1 album was particularly hard. In the various versions of the list before the final draft Disturbed and Beartooth both had the top slot before Ghost grabbed it in the final take. Honorable mentions go to these artists who just missed the cut and who would have been a longer list including Judas Priest, Bullet for My Valentine, OTEP, Parkway Drive, Of Mice & Men, The Struts, Slash and others. Also, some albums that came out late in the year will carry over to the 2019 list including All That Remains. Last year, Brutus produced his first ever calendar. It featured images from lighthouses he’s photographed around the world. Yeah, he’s kinda nerdy with that stuff. For 2019, we’re happy to announce two different calendars that you can only get thru social media. 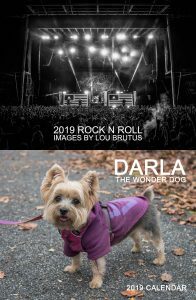 The first calendar is “2019 Rock N Roll Images by Lou Brutus.” It features twelve black and white photos of stars both onstage and backstage that Lou interviewed during the year. 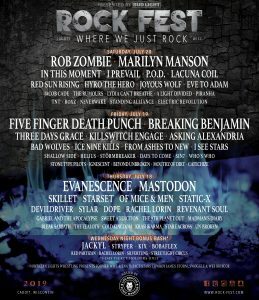 Artists include Avenged Sevenfold, Metallica, Avatar, Five Finger Death Punch, The Pretty Reckless, Slipknot and others. These calendars are NOT for sale and will be in very limited numbers. The Darla calendars were produced in an especially small print run. The ONLY way to get them is to win them thru verified Lou Brutus social media accounts. Good luck.